Getting kids behind the wheel of a vehicle can be a scary thought. And if your kids are eager to get driving, but not old enough for the real thing yet, then battery operated four wheelers for teens are a great idea. Four wheelers are a safe driving option that encourage teens to spend more time outside, and battery powered means no gas bills and that the bikes are more environmentally friendly. Buying your teen his or her first four wheeler doesn't have to cost you a fortune, and as long a you know what you're looking for, you can be assured that your child is safe and on a good quality vehicle. There are some great battery powered four wheelers on the market right now, so why not check out a couple of these models? 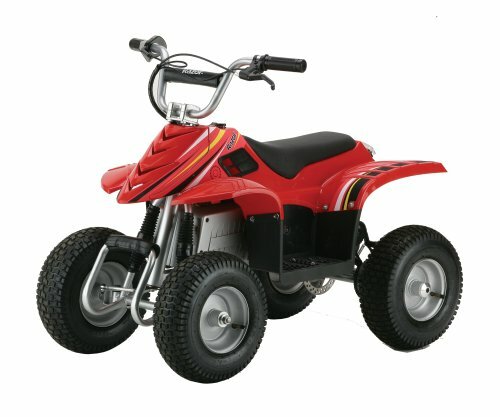 Our first recommendation goes to the ATV Razor Dirt Quad, which is an excellent first bike for younger teens. It's a twenty four volt unit, so it's not the most powerful quad bike around, and it has a maximum weight capacity of 120 pounds, so it's for younger kids. But it's got some nice specs. The wheels are rubber tired, unlike many 4 wheelers that have plastic wheels, so there's more traction and therefore safety. It has droop travel suspension, so it stays close to the ground even on extremely uneven surfaces, meaning your kid won't bounce out of his seat. The body is shatter resistant plastic over a tube steel frame, so it's hard wearing and durable. Adjustable twist grip throttle handlebars make the vehicle easy to drive even for the complete beginner, and the rear brakes are also hand operated for ease of use. There's a front guard for safety and a padded seat for comfort. All in all, this is one of the best beginner four wheelers on the market. It's also relatively light at around ninety pounds, and can be stored vertically to save space. An excellent first 4 wheeler for the young teen. The best part? It'll cost you less than five hundred bucks. The Polaris Ranger EV is only for the serious enthusiast, but it makes a phenomenal four wheeler for older teens. The eight twelve volt batteries men that's there's plenty of power on board, and full, real off-roading tires give great traction. It's got a top speed of twenty five miles per hour, which is faster than most, and can go around fifty miles between charges. Strut front suspension and independent rear suspension mean that you're safe even on the rockiest ground. The Ranger EV doesn't come cheap, it'll cost you the better part of ten thou, but it is by far the best battery powered four wheeler on the market. Be warned though, this really isn't a vehicle for younger teens, and it does require some skill to drive. The X-Treme XA-1000 is a great compromise between the above two models. It's still a full on battery powered four wheeler, but it's a little more powerful than the Razor Dirt Quad whilst being a lot more affordable than the Polaris model. It's got five twelve volt batteries, full sized wheels and hydraulic disk brakes, so you've got some good specs. It gets around three hours of use to each battery charge too, which is excellent compared to most other models. The X-Treme isn't the best first four wheeler for a young teen, but mid-teens should be more than satisfied with its power, whilst parents will appreciate its price tag. Finally, another X-Treme model, this time the XA-750. This is the baby brother of the XZ-1000 model above, and is an excellent first four wheeler for any age of teen. It doesn't quite have the power of the XA-1000 model, having only three twelve volt batteries, but it still has the full sized wheels, hydraulic disk brakes and independent front and rear suspension. Top speed is around fifteen miles per hour, and the battery will last for around fifteen miles of travel. This is a great choice of quad bike for the first timer, and whilst it is a fairly low spec vehicle for an adult four wheeler, as a teen's first vehicle it's a truly great choice. And as far as cost is concerned it's a bargain. Buying a battery powered four wheeler for your teen is a great way to get your kids out and about as well as teaching them the elements of safe driving that they'll need in later life. And with any one of the above models you're sure to be a satisfied customer, and your teen will be thrilled with his new vehicle. If you have any questions, comments or remarks either regarding the article 'battery operated four wheelers for teens and kids' or about any of the models mentioned above then please do not hesitate to make them in the comments section just below and we will be sure to get back to you as soon as possible.